Lylah M. Alphonse: Couple to marry on 9/11: "If we don't take back that day ... the terrorists win"
Couple to marry on 9/11: "If we don't take back that day ... the terrorists win"
Another profile I wrote for Yahoo! News went live this week. 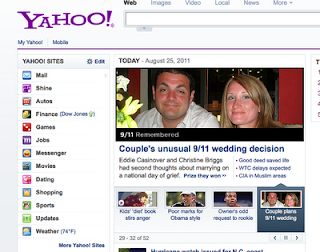 This one is about a young couple getting married on the 10th anniversary of 9/11. Click here to read their uplifting story.